Your kitchen is like the heart of your home. It's a gathering space, an eating area, and so much more, which is why it tends to get overwhelmed with clutter pretty quickly — but don't lose hope. From cool new cabinet fronts to savvy DIY kitchen islands, you can save money by repurposing Ikea basics into something that looks uber high-end. With a little creative thinking and a bit of handiwork you can make your kitchen as functional as it is beautiful with the help of these nine clever Ikea hacks. 1. 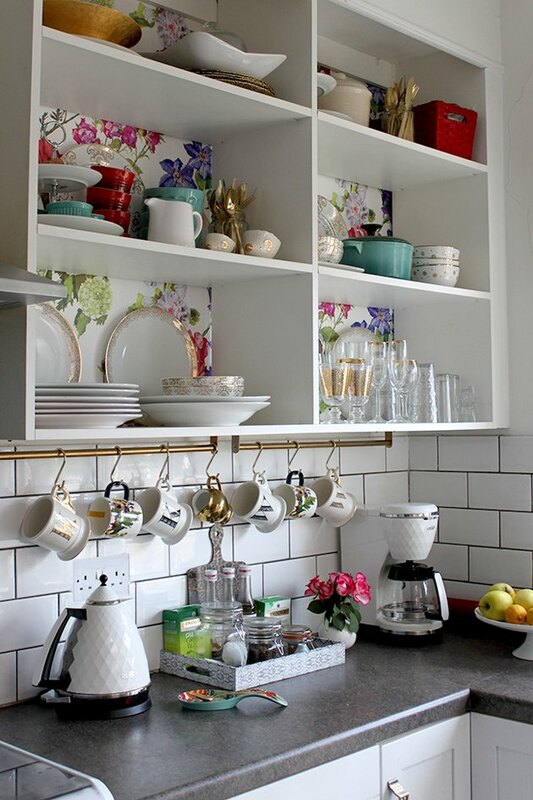 Hang coffee mugs from a rail to save cabinet space. If you've run out of cabinet space for your extensive coffee cup collection, opt for hanging a few of your faves from these Grundtal Kitchen Rails ( $ 18.99 ) using metal S-hooks. Kimberly from the blog Swoon Worthy gave hers a glam makeover with a little bit of gold spray paint. You can also hang spatulas, ladles, scissors, or even small pots and pans from them, too. 2. Build a rolling island for extra counter space. Believe it or not, this little rolling island used to be a small Ikea bookcase ( $34.99 ). But thanks to the ingenuity of Holly from the blog Club Crafted, it now serves as an extra dining space. Check out how she worked her magic here. 3. Turn bed slats into a handy hanging storage wall. This handy-dandy hanging wall storage used to be a twin-size slatted bed base ( $30 ) from Ikea. Yup, that's right: with just a little time and effort — don't worry, your little one will sleep fine with their mattress on the floor — these wood slats can be transformed into the perfect, all-purpose storage solution. Follow Kristina from the blog Ich Designer's lead to create a stylish and organized display. 4. Organize spices on a pretty picture ledge. Who needs to see photos from last year's summer vacay in Mexico? Use Ikea picture ledges ( $6.99 ) to display your pretty assortment of spice jars, instead. Beth from the blog Dotty Dishes painted hers a chic gray hue that would blend in with her home's decor seamlessly. 5. Build your own kitchen island. If your kitchen is short on storage and could use some extra counter space, too, then this is the perfect DIY solution. Courtney from the blog Golden Boys and Me transformed three Ikea bookcases ( $69 ) into a fabulous kitchen island. Check out how she made it all come together. 6. Create custom cutting boards — on a budget. Upgrade these ordinary Ikea cutting boards ( $5.99 ) to create your own custom design using leather string. Simply wrap it around the handle and tie it into a knot to add your own rustic flair. Or, use a thicker strip of leather for easy hanging. Get the how-to here. 7. DIY industrial open shelving. DIYers everywhere are loving these Ikea brackets ( $13 ) (which come in an affordable two-pack) because their uses are just about endless. For example, Colleen from the blog Lemon Thistle used them, and a couple of wood planks, to make some sleek, industrial shelving for her kitchen. 8. Build some extra storage space. Have an awkward, empty wall in your kitchen? Don't let it go to waste. Start with a basic Ikea cabinet ( $70 ) and transform it into a modern storage unit. Mike and Megan from the blog The Fresh Exchange will walk you through each and every step they took to create this beauty. 9. Stay organized with a surprising storage solution. Keep essentials handy — like plastic bags, tin foil, Saran wrap and more — by storing them in an Ikea magazine holder ( $9.99 ) that's attached to the inside of your cabinet door. Use removable Command strips to avoid damaging your cabinets with nails or screws.